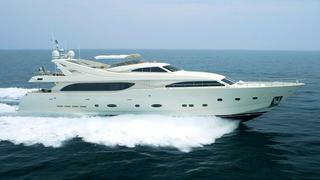 Costis Pontifex at Ekka Yachts tells me he's joined forces with Ferretti to list the 34m motor yacht Thalyssa for sale. On the market for the first time by her original owner, Thalyssa was built by Ferretti in 2005 as one of the Custom Line 112 series. Accommodation is for 10 guests in five staterooms including a master suite on the main deck and she's powered by twin 2800hp MTU engines. Thalyssa is asking €4.9 million.